1. Start by making a template: download and photocopy the design, sizing it to fit your pumpkin. 2. 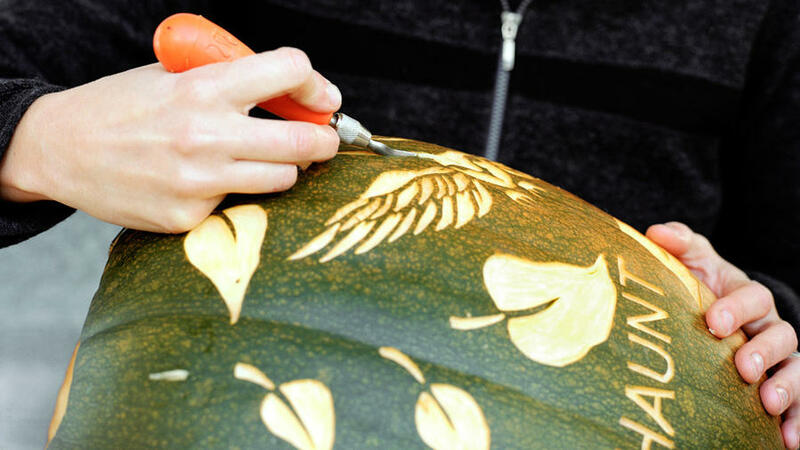 Tape the template to a clean, dry, and hollowed-out pumpkin. 3. Using a pushpin, prick closely spaced holes along the outline of the design, making them deep enough to be seen when you remove the template. 4. Remove the template. Following the pinpricks and taking care not to cut all the way through, use a small carving chisel or linoleum cutter to outline the design. With a larger linoleum cutter, remove the rind within the outlines and scrape out some pumpkin flesh (the deeper you go, the more light will shine through). Add texture and dimension by varying the direction and depth of your carving. Artist Nikki McClure shares instructions for creating this unique jack-o’-lantern for Halloween. Get the free stencil and how-to. 5. Light your pumpkin. A votive candle is traditional, but for more illumination, use a battery-powered or outdoor-rated electric light (from $1.99; funkins.com); carve out a hole for the cord if necessary. McClure recommends the Speedball eight-piece linoleum-cutter set ($16; danielsmith.com). Variegated pumpkins look dramatic, ‘Small Sugar’ heirlooms are smaller and easy to carve.